The latest numbers from YouGov Plan & Track indicate that 62% of US men who drink alcohol tend to do most of their drinking at home. And daily brand data shows that they might be bringing home more whiskey this time of year. 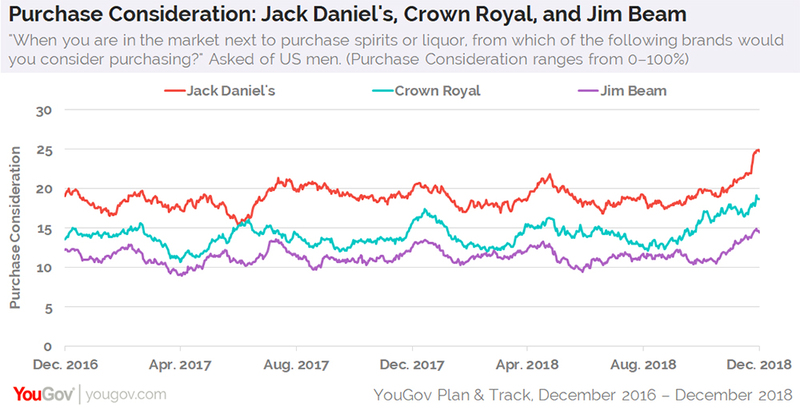 According to new figures, whiskey brands Jack Daniel’s, Crown Royal, and Jim Beam are all experiencing Purchase Consideration highs among US men — meaning more male consumers are open to buying the aforementioned spirits than during the last two holiday seasons. This past December 1, for example, 25% of US men expressed interest in purchasing a bottle of Jack Daniel’s when next in the market for hard alcohol. That percentage is notably higher than the 19% of men who were open to buying Jack Daniel’s on December 1, 2016, and the 20% who reported the same on December 1, 2017. Crown Royal and Jim Beam also saw comparatively high Purchase Consideration levels this past December 1. Crown Royal climbed to 19% among men, while Jim Beam hit 14%. One factor that’s likely related to this spike in Purchase Consideration among men is a similar rise in Ad Awareness. This past December 1, 24% of male consumers reported seeing an advertisement for Jack Daniel’s at some point in the past two weeks. That’s a higher rate compared to this time of year in both 2016 and 2017, when 21% of men recalled seeing commercials for the brand. 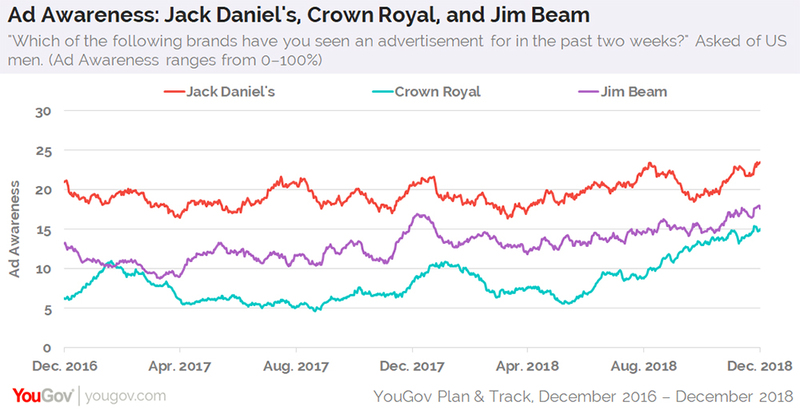 Likewise, Crown Royal and Jim Beam are currently receiving the highest levels of Ad Awareness they’ve received in the last two years. At the same time, however, additional numbers from YouGov Plan & Track reveal that 33% of American men who drink alcohol are usually happy to drink whatever everyone else is having, compared to 26% of US women who drink.